Owners do not need to be marathon runners, but to maintain the animal’s health and well-being, the Saluki should be well exercised with a long brisk walk daily and a regular run off lead in a safe place. Keeping two is easier than one, particularly if they are to be left alone during the day. Inside they are clean, quiet and have little or no odour. Some will need more stimulation than others, but they are a pleasure to live with, being gentle, tolerant animals, happy to rest and sleep in between bouts of play and exercise. However, families need to be aware that they are uncomfortable with human ‘rough-house’ play. They are tolerant and affectionate with young family members, but need to be able to retreat to a peaceful spot. They require only minimal, but regular grooming, as the body coat is smooth and silky, with special attention to the feathered ears and tail needed to keep them free of tangles. The Saluki will flourish in today’s world if treated as a member of the family, fed a well-balanced diet, exercised regularly and provided with clean, warm and comfortable bedding. They slip easily into a life of luxury! The Saluki is generally a light but sometimes fussy eater, needing little more that 300-450g (depending on size) of complete and balanced dry food- or its equivalent- daily as an adult. 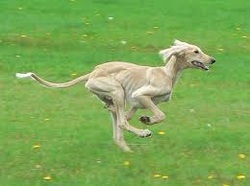 A good quality diet ensures a healthy Saluki. It is a sound breed, free of most genetic problems. If veterinary intervention is required for surgery, owners need be confident their practitioner is familiar with the sighthound’s idiosyncratic respiratory system. Regular checks of the eyes, ears, skin and mouth is sound practice. While no DNA tests are required before breeding, regular heart and thyroid testing of breeding stock is wise. They are late developers, so young Salukis need firm but conciliatory training and plenty of socialization to become well-adjusted adults. Lack of stimulation or human affection, harsh handling, or frustration can produce acts of defiance and destruction. ALL need an escape- proof safe area in which to live. Salukis are “for life” and with the exception of accidents, will live to the age of 13-17 years or more.